When President Roosevelt visited Buffalo in November 1940, he found a hardworking city with a large immigrant population manufacturing aircraft for the Allies. Nearby Fort Niagara inducted over 100,000 young men, resulting in an acute labor shortage. American Brass, Bell Aircraft, Chevrolet, Curtiss-Wright, Houde Engineering and Republic Steel reluctantly, then gladly, hired women. More than 300,000 defense workers toiled in hot factories for high wages despite transportation, housing and food shortages. The aircraft plants alone employed 85,000 on forty-eight-hour workweeks. Buffalonians watched the flag raising at Iwo Jima, participated in the Manhattan Project and observed the formal surrender of Japan in Tokyo Bay. 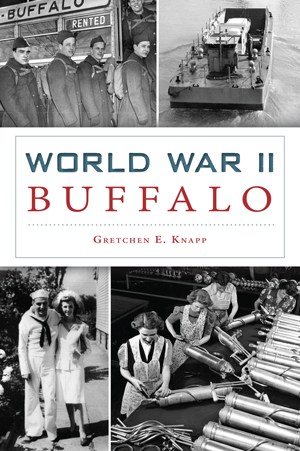 Author Gretchen Knapp brings to life the challenges and contributions of daily life during wartime. Gretchen Knapp, PhD, is a native of the greater Buffalo area, having grown up in the town of Tonawanda. She earned her doctorate in history from the University of Buffalo and MLS from the University of Maryland. Knapp taught U.S. history and archives at Illinois State University and received fellowships from the New York State Archives, the University of Minnesota Social Welfare Archives and the Herbert Hoover Presidential Library. She lives in Normal, Illinois, with her husband.